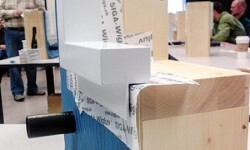 Some call the “Secret Sauce” for Passive House the stringent air sealing. Heat losses through cracks and gaps have been reported to reduce energy efficiency up to 30%. By meeting the air-tight level of a Passive House of 0.6 Air changes per hour the health of the occupants is also improved because air leakage leads to condensation and mold. A typical house can have up to 1/2 mile of cracks. One of the most common areas for air leakage is at joints where walls meet roofs, floors meet walls, and around window and door openings. 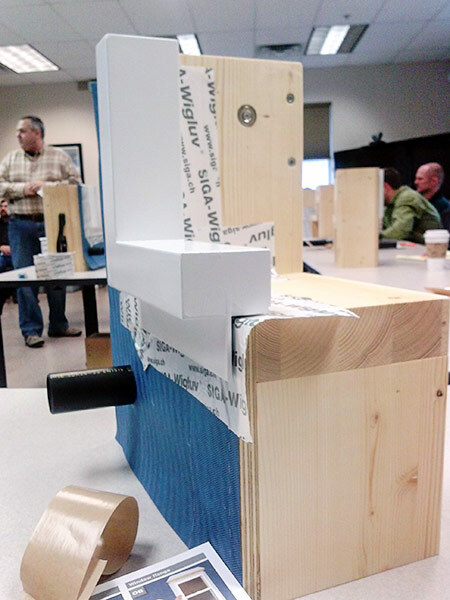 Seen in the photos below, contractors and at least one architect (me) attended an air sealing workshop hosted by Bellingham’s Building Performance Center and sponsored by Small Planet Workshop based in Olympia. 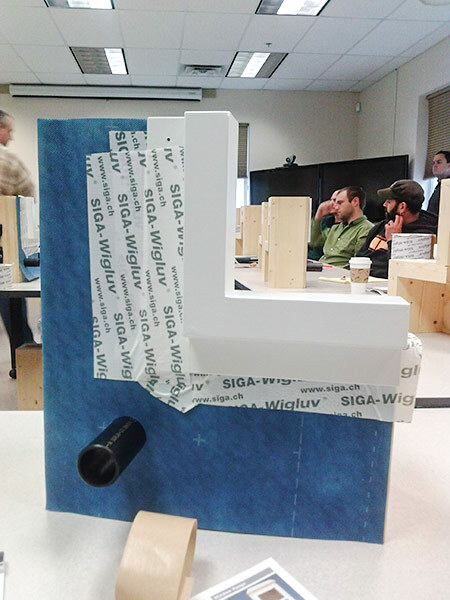 This hands-on workshop, which demonstrated SIGA air sealing products really showed how simple it is to achieve good air scaling. 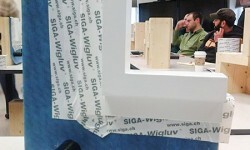 Of course, with a super air-tight building, fresh air ventilation is essential. Next blog topic will be PH ventilation with Heat Recovery Ventilators and Energy Recovery Ventilators that can recoup up to 95% of the heat from air before it is exhausted from the building while providing continuous fresh air.